Rejuveniles rejoice! 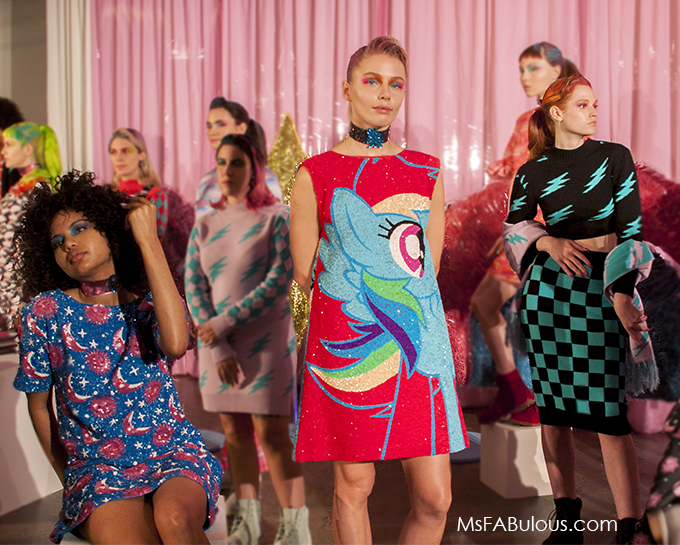 Hayley Elsaesser created the flamboyant My Little Pony collection of your dreams! The Canadian designer is known for her bright graphic prints and wildly fun attitude. The toy brand approached her for collaboration, finding their mutual aesthetic to be a great fit. This color palette for this season was the most saturated shade of pretty much any color you can think of. Motifs included rainbows, clouds, hearts, plaid, lightning bolts and the star ponies themselves. You could find cute shift dresses, knit dresses, sweaters, short skirts, ruffled cropped pants for the ladies. Men were offered woven shirts, pants, hoodies, jackets and overalls. The candy-colored hues didn't stop at the clothing. Male and female models were styled with the same colors in their hair and eye makeup. I loved that the abundance of color was also reflected in the casting. Models represented all ethnicities and body types. When I spoke to Elsaesser, this was very important to her. She wanted to make sure her presentation reflected her fans and customers. The event was planned as a party. Guests were treated to nibbles and a sticker photo booth. Gift bags included a My Little Pony Pez dispenser, along with stickers, nail art and cookies. I love seeing fellow Canadian fashion peeps make their way down to NYFW. Her boutique is located on Queen Street West a few block away from my first internship in fashion when I still lived in Toronto. Thank you, Hayley Elsaesser, for starting NYFW off with a joyful bang. I cherish shows that bring a giddy smile to my face. My Little Pony is an easy way to do that. The clothing is so fun, I am shopping on her site as I write this.